Iron is an extremely important trace mineral. 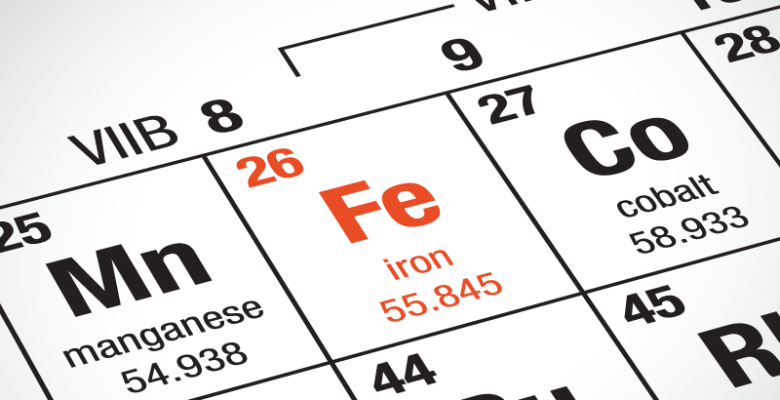 Iron is an essential component of hemoglobin and myoglobin. They both transport and store oxygen. Hemoglobin (within blood) stores 2/3 of the body’s iron. * Myoglobin works its magic in muscles. It is vital. Sometimes altering iron levels changes everything!! Do you suffer from any of the following symptoms? Follow a vegetarian or vegan diet? Are you a teen going through a growth spurt? Keep a food journal to show your nutritionist. It may be as a simple Adjustment to the diet! The recommended daily dietary intake is 8mg/day for adult males. Women are recommended to reach 18mg/day. Athletes need a higher intake. Athletes tend to breakdown red blood cells at a higher rate. Runners may be more at risk due to the pounding foot strike. 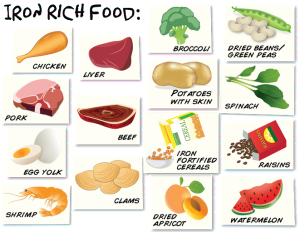 Iron is readily available in meat, fish, poultry and shellfish. This is the “heme” version and is easily absorbed. Dairy and dried fruit offer iron. Vegetables contain iron. This iron is the “nonheme” form. The short version… it won’t absorb as quickly. Speed up the process by squeezing lemon or orange juice on! VITAMIN C does the trick! Dark green vegetables contain iron BUT they also contain oxalic acid. Oxalic acid needs to go! Drop the vegetables into boiling water for 5-10 seconds! (if you are a foodie, simply blanche them!) This process dumps the oxalic acid yet keeps iron! Heme IRON can be found in lots of different animal products. Iron is readily available but ALL of those cause inflammation in the body! If you are a meat lover please choose organic grass fed meat! 1/2 cup cooked spinach 5mg (organic) Don’t forget to squeeze lemon juice on! Increase iron by cooking foods in a good old fashioned iron skillet! Still rundown after diet adjustments? It’s time for a blood test! Please don’t just start iron on your own!! IRON is TOXIC! It can cause tissue and liver damage. When I became a vegan my iron was so low the doctor said,” I am shocked you can get out of bed!”. Overnight I began supplementing. I love liquid iron! Tastes great, quickly absorbs and it works well with my digestion system! Low quality iron supplements tend to cause constipation. I take iron with 1/2 Oz orange juice or piece fresh grapefruit before bed!